Sizing a PV Array correctly can be the difference between winning and losing a commercial contract. Oversizing an array can lead to space planning issues having knock-on effects to other items of roof mounted plant resulting in significant additional costs (In addition to the overpriced PV array). Here at Watt Energy Saver we understand the Construction process. We have in-depth knowledge of Building Regulations Part L and the software used to ensure compliance. In addition, our continual investment in the latest software technologies allows Watt Energy Saver to be at the cutting edge of construction. Through early engagement with the design team, in particular, the Low Carbon Consultant (LCC) Watt Energy Saver are able accurately design the size of the PV array to match the Part L requirements. This early collaboration not only saves capital cost but also reduces modelling time, significantly reducing design costs whilst improving accuracy early on. We set out below the design process we undertake to ensure we offer our customers the best value whilst meeting design obligations. Here at Watt Energy Saver we understand the detailed design process required to not only gain a grid connection, but design the system which meets the particular client’s requirements. By engaging with Watt Energy Saver, our clients get more than just a contractor’s approach of maximising the capacity of the roof. Our consultative design-led principles help us understand the client’s requirements, be it maximising self-consumption, cutting CO2 or long term investment. No matter what the case, one common denominator is always required. Existing consumption. Ideally this will be in the form of 12 months of historical Half Hourly metering data. This allows our engineers to accurately profile energy usage on the site and begin to model the PV array in the latest design software. This detailed approach allows us to deliver accurate yields and self-consumption data resulting in accurate return on investment calculations. Many specifications we come across stipulate the Solar Photovoltaic (PV) requirements in terms of m2. This can result in vast cost / performance differences depending upon the power class of panel utilised. 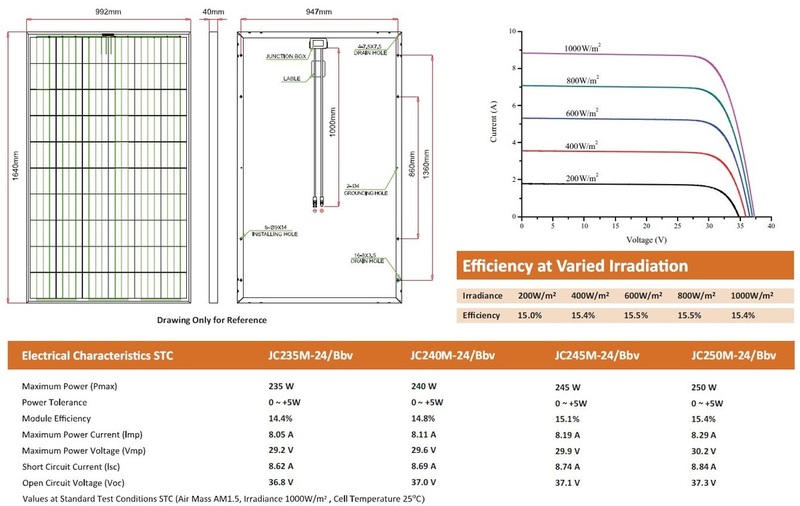 Essentially most 60 cell panels are the same dimension but can vary in output from 235W to 330W. Not only is the annual performance varied, the capital cost will also be significantly more, the higher up the power classes you go. The difference in cost from a 235W panel to a 330W panel can be in excess of £150 each, which for a 30kWp array would equate to over £18,000. We often challenge Low Carbon Consultants (LCC’s) that the generator they have specified significantly exceeds the requirements of their Part L calculations. It is usual for us to find systems oversized by 25%, adding significant cost to the construction bill whilst taking up valuable roof space which may have knock on effects with M&E plant selection. There is no direct reference to the modelling method prescribed for introducing the output of PV arrays into EPC calculations within any of the official documentation. As a result of this it falls to the discretion of the accredited energy assessor and their accreditation body. As far as we are aware iSBEM, IES-VE, TAS and other accredited software are NOT embedded design tools and do not have the capability to design an embedded generator using PV as the generating source. Whilst some take into consideration basic characteristics such as panel efficiency, orientation and weather data. It does not consider many other important factors including inverter matching, AC / DC volt drop, installation methodology, system degradation, panel mismatch, soiling to name but a few. It is our understanding that the role of the chosen Low Carbon Consultant (LCC) is to determine the required level of kWhs that the embedded generator is to produce to satisfy Part L Compliance. Ultimately the LCC is to provide an EPC for the project based upon satisfying themselves that the data provided by a specialist embedded generator supplier is of sufficient accuracy that they are confident it will meet the necessary for Part L Compliance targets. We have independently clarified this point with CIBSE and they understand that the PV modelling tools within iSBEM, IES-VE, TAS and other accredited software may not suitably represent the output of arrays. Where design calculations produced by a suitably qualified PV designer are available, the output from these may be used within the EPC assessment. This may take the form of inputting the actual design output of the PV array or adjusting the m2 array area within the EPC software to reflect the actual design output of the PV array. For the correct way to calculate the annual yield requirement (kWh) we need to refer to the construction issue BRUKL report. We take the Area of the building in m2 and multply by the kWh/m2 required from the Photovoltaic System. Conversant with BIM and able to integrate with Full 3D REVIT modelling, Watt Energy Saver can seamlessly plug into your construction team from development (RIBA Stages 0-2) to Detailed design (RIBA Stages 3-4) through to Construction, Handover & Ongoing O&M (RIBA Stages 5-7). Each and every project we undertake is treated in the same way. We generate a full 3D scaled model of the building and its surrounding environment to verify space planning and shading potential. Following the establishment of the space available and the mounting methodology, the data is inputted into the design software. Several scenarios can be quickly run to ascertain the most cost effective solution, taking into account panel selection, inverter matching, mounting system, space planning etc. This design process is afforded to all of our construction partners, allowing accurate pricing and early cost certainty. Our estimating package is linked to a national database, updated on a weekly basis to ensure all our prices are current. In addition, we are members of several trade associations allowing us to keep abreast of the constantly evolving renewables industry including legislation, grants and technology. The level of accuracy and experience not only gives the client confidence in our ability to deliver, it also provides a robust, lean cost to help secure the project during the bid process. A recent Technical College project highlighted the value we can add to the design & construction process. The specification called for 725m2 of Monocrystalline solar PV. Following a request for a copy of the BRUKL report it was established that a yield of 82,162kWh/Annum was required. Our detailed calculations resulted in excess of a 16% reduction in size to that originally specified, whilst still exceeding the Part L requirement and offering a £20,000.00 saving too. Why not see how you could benefit from our experience? Get in touch the next time you need a partner you can rely on to deliver.